Today i was having lunch and decided it was time to check my emails on my phone. 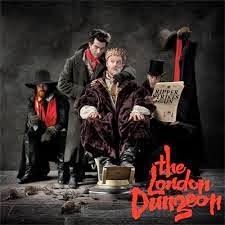 To my great delight i had won a family ticket to the London Dungeons. I take Tilly to the dungeons quite a lot because it really isnt scary for children because they have the policy never to touch the kids and never scare them. It is a family attraction and is part of the Merlin Attraction franchise. Tilly quite understands that these people are dressed up and only 'pretend, She even thinks some of them are dressed as princesses because they wear the olden day clothes.